Almost 7,000 "Islamophobic" tweets were sent, in English, every day in July worldwide, data seen by the BBC suggests. This compared to 2,500 in April, with peaks recorded following the Nice lorry attack and the attempted military coup in Turkey. Forty-nine words and hashtags were used as indicators of anti-Islamic tweets, by the think tank Demos. Twitter said it was "continuing to invest heavily" in preventing abuse. Demos analysed tweets recorded between March and July, and judged there to be 215,247 tweets - sent in English - that were "highly likely" to be anti-Islamic, derogatory or hateful. The vast majority of tweets that could be located to Europe came from the United Kingdom, with other concentrations in the Netherlands, France and Germany. 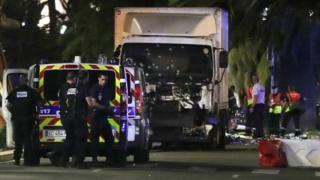 The highest number of "Islamophobic" tweets to be sent in one day, 21,190, came on 15 July - the day after a man ploughed a lorry into crowds on the seafront in Nice, killing 85 people. Jihadist group Islamic State (IS) claimed one of its followers carried out the attack. Other peaks came on 17 July, the day after an attempted coup in Turkey, in which 10,610 such tweets were sent, and on 26 July - the day a Catholic priest was murdered by militant Islamists in a church in the French city of Rouen. IS subsequently claimed the church attackers had pledged allegiance to them. Higher numbers of anti-Islamic tweets were also seen in the days following an IS-claimed suicide attack on the Iraqi capital, Baghdad, that claimed more than 250 lives on 3 July - with 9,220 such posts on 5 July - and the day after shootings in Dallas, US, in which five police officers were killed. The gunman, Micah Xavier Johnson, was not a Muslim. While other factors could have added to these two spikes, Demos said, these events were the most likely causes. Carl Miller, a research director at the left-of-centre think tank, said the tweets were worrying as they were examples not of people "being angry at Islamic State, [but] people who are being angry at the wider Muslim world". He described such posts as "damaging, harmful, and tremendously problematic", but added that - in UK law - "only a thin sliver of them are actually illegal". "Only when there's an actual threat to life are people actually breaking the law, and therefore the people that are in the online space are actually far less protected than the offline space when it comes to receiving that kind of abuse." Ruqaiya Haris, 23, is a student in London who - as a published writer - is active on Twitter. She has received tweets that tell her Muslims have "had enough time here", are "not integrated enough" and are "threatening our way of life". She said she "always" receives a greater volume of messages following attacks such as the one in Nice. "It doesn't really matter what I say, or what I'm writing about, or what I'm posting about. The responses after some kind of terrorist attack will always be slating Islam in some kind of way - or insulting Islam, or insulting me, or insulting my hijab. Deeyan Khan is the founder of Sister-hood, an online magazine showcasing female Muslim writers. She believes frank conversations need to be had so people feel less need to be abusive online. "Every time a terrorist attack happens, we don't need to get a bland press release from the mosque around the corner saying we condemn it," she said, "that's not what people want to see." Ms Khan also believes that shutting down abuse is not the answer, and instead advocates a focus on educating people about what she sees as the hidden issues. "I think what people don't know in the West is that the first targets [of extremist attacks] are other Muslims. Muslims have been suffering at the hands of these barbaric groups for decades. "Many of us have faced persecution, violence, imprisonment because we have taken on extremists - but that's not the story that you're often told." A spokesperson from Twitter said: "Our rules prohibit inciting or engaging in the targeted abuse or harassment of others. "We are continuing to invest heavily in improving our tools and enforcement systems to better allow us to identify and take faster action on abuse as it's happening and prevent repeat offenders."